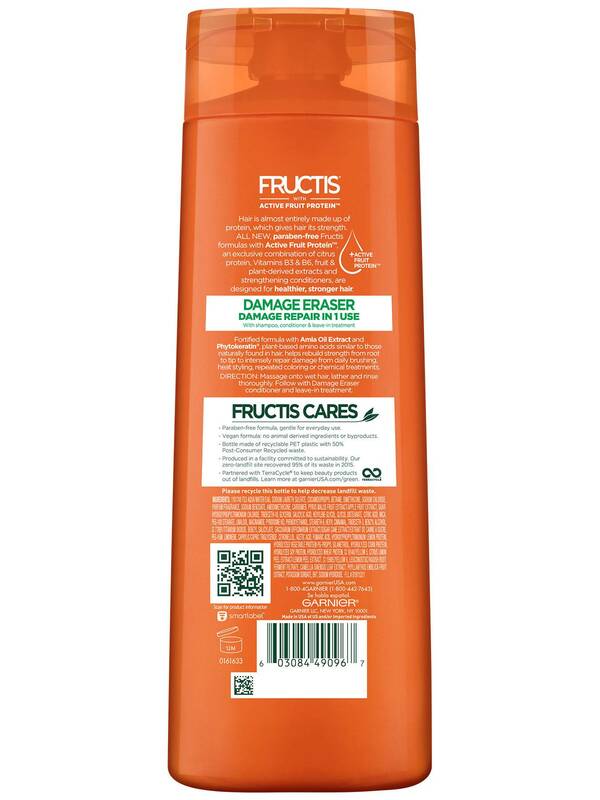 Fortified Fructis Damage Eraser Shampoo with Amla Oil Extract and Plant-Keratin, plant-based amino acids similar to those naturally found in hair, helps rebuild strength from root to tip to intensely repair damage from daily brushing, heat styling, repeated coloring or chemical treatments. Massage onto wet hair, lather and rinse thoroughly. 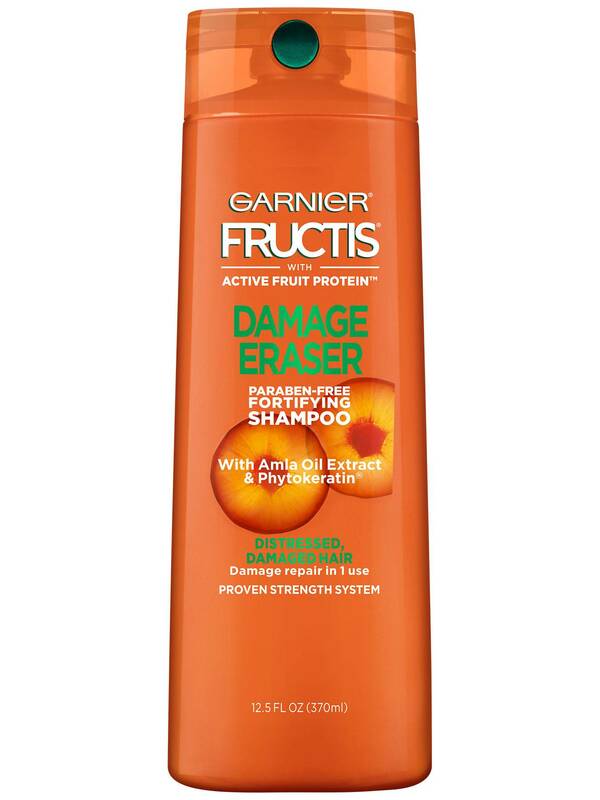 Follow with Damage Eraser conditioner and leave-in treatment. Rated 5 out of 5 by Jay Mac from For me worked the first time Had hay instead of hair dry and damaged. This is the only shampoo and conditioner combo that worked. Others left hair lifeless too greasey then you'd use less to avoid that didn't work at all then. This was noticable first wash. Rated 5 out of 5 by Josie91 from Amazing!!! I bought this a couple days ago and i am in love!! I have super thick and wavy hair so its really hard to find good shampoo. My hair gets tangled fast but after the first use of this shampoo and conditioner, my hair is super soft and smooth that i don't even have to put gel on it to take it. Thaaank you for this product. Its affordable and does wonders on my hair. 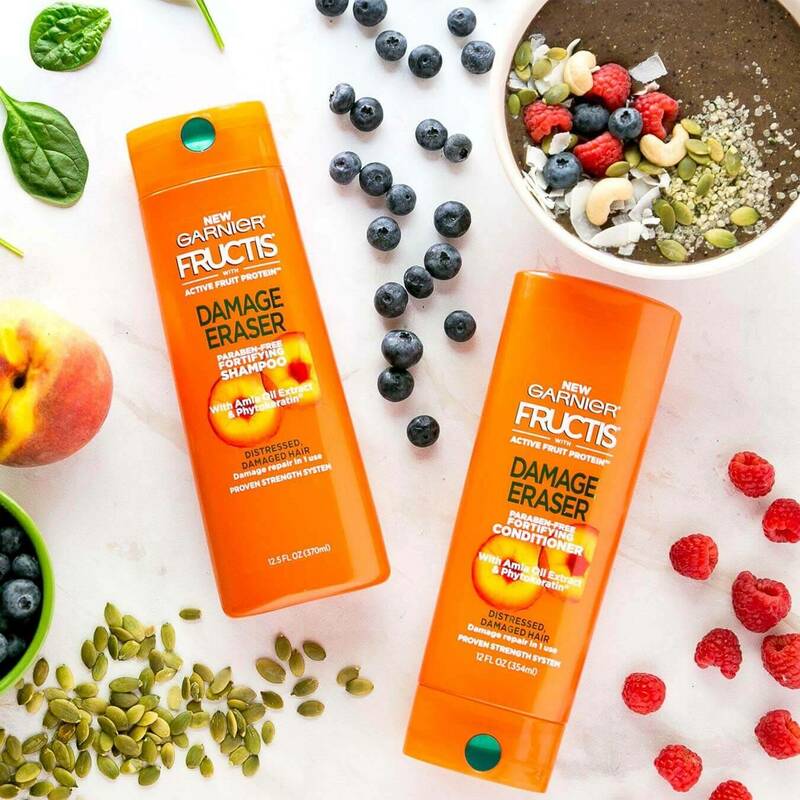 Rated 1 out of 5 by Roge NY from Not good for my hair I’ve been using Garnier Fructis for many years. My hair is very thin and easy to be managed. I like to try new fragrances so I decided to buy the damage eraser shampoo and conditioner. The smell is very good but every time I wash my hair instantly it gets greasy, sticky and dull. No shine at all. I was forced to buy another brand. Rated 1 out of 5 by exo1224 from Does more harm than good My hair is normally very easy to work with, but after using this shampoo, my hair clumps together and develops a bizarre texture about 30 minutes after washing it. It looks very oily, as if i haven't washed it for years, even if I've just stepped out of the shower. This effect doesn't go away for days. At first I thought maybe my hair just needed to get used to it, but even after using it almost every day for 2 months, nothing changed. I'm not sure what causes this, as none of the other shampoos from the Garnier Fructis line do this to my hair. Rated 5 out of 5 by Classylove23 from Love your products I love all your products. Especially shampoos and conditioners with Moroccan oils. I have curly hair and it hard to manage. Rated 2 out of 5 by Soli from Damage Eraser. I love Garner, however, I was disappointed that the formula was changed. Before it was a creamy texture that left my hair very smooth. This new product tangles my hair, I don't like it at all. Rated 5 out of 5 by MrsWonderful from My Hair Feels Amazing Just bought this tonight and My Frizzy and Very Thick Hair feels Amazingly Soft and Smells great.